This is how my parents travelled and visited dining cars in their train travel. Its a pity we let go of the fabulous institution of the railway dining car, apart from the contrived and over priced palace on wheels, which also have modern and tacky luxury coaches and dining cars, since they were converted to broad gauge. Its seldom we see modernity and tradition being married together. I remember stories told by father about the luxurious rail travel, a travelling salesman from the late 50s- through the 60s and some part of 70s until he switched to air travel. Travelling with an orderly, always first class with bandobast for the chotta peg (scotch) and tin of cigarettes (state express 555). He was working for a english boxwallah company. 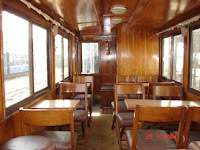 The railway dining car, the dining rooms and the retiring rooms in towns and moffussil Casbahs were particularly luxuriant especially when travelling in first class. Its poor cousin would be the Kingfisher First Lounges in India today. Food was nice and developed a fan following with many chefs, the railway food has been glamourised in the Raj era cusine and the Anglo India Cuisine, Railway mutton cutlets (with and without gravy), railway mutton curry at the Tiffin at the Oberoi. Th Oh! Calcutta Anglo Indian menu plagiarises the railway menu of that era. Even restaurants in London, the old and famous Coomaraswamy, erstwhile Chutney Mary and the three year old Sola Topee in Gurgaon glamourise and apes what is basically the erstwhile railway food. Travelling up to Shimla from Kalka in first class in 1990, which is pretty much the current era, as a family, Dad challenged what would you like to order for lunch.We said get real we will get cold thalis. We got the option of tea in a set on the go (in the train) and fresh chicken curry and rice, served at Barog, railway station refreshment room. Yes it did happen. He got a wire sent through the railways with our order. He knew the beat and the system, therefore he struck a rapport with the old timers and extracted the last show of the Raj opulence for his family. Many such stories, rendevous of my parents in the retiring room in Barielly, my dad travelling on work from Lucknow, my mom though married, finishing her final year at Miranda house. They agreed to meet at Barielly for sneaking a weekeend at Nainitalin the late 50s. The quality of retiring rooms was pretty good and the corporate world piled on to the government machinery (the retiring rooms, the dak bungalow, the circuit house, forest rest houses, PWD rest houses in the absence of decent hotels). I have exprienced some even in my time. The railway restaurant in Barog and perhaps 300 others were termed railway refreshment rooms, were run by the Spencers chain (which is now acquired by RPG enterprises and runs retail chains). Spencers were always in the retail business, ran stores in the high street of urban India and also stores in Cantonements and Tea Plantation towns and hill stations (basically where there was a clientle). More importantly, the hotel and restaurant business with the Connemara in Madras (Now with The Taj), and of course the railways and the retiring rooms and the liveried waiters. The yummy continental food. One does see a hint of that even today, in a weak genetic strain. In my research, on railway food I came across this mailway menu designed a few years ago. You can see the continental food lineage of the Spencers http://www.nr.indianrail.gov.in/scripts/static/Miscellaneous.aspxtrains of Catering A-La-Carte items sold in the Pantry cars, Refreshment Room/Stalls (w.e.f 1.6.2003), one still sees roast mutton , chicken cutlets, tea and coffee in a set.the genetic code is still alive. The railways and its peripheral facilities were used by lots of well to do people as a hub, to rest, change, recuperate, eat drink and meet. There are interesting films in the Hindi film circuit, which have the retiring rooms as the back drop of the story, especially the Rekha, Anooradha Patel and Naseeruddin film of the 80's called Ijazzat. A must see, which raises the nostalgia of train travel.The fantastic hotel on the beach (now receeded, and taken over by the Chanakya group of Patna) at Puri and Ranchi called the BNR Hotels... Bengal Nagpur Railway Hotel. All relics of the Raj, offerered unique and differentiated experiences. Though a recent thread on Indiamike.com recently made a mention of interesting foods on the various stations in the Indian circuit. There are still some hidden gems and experiences. Like my Grandfather said, good visual beauty and locales in the journey, usually bad food on the stations, bad locales and boring journey great food. Lucky to get both. My favourite staions are on the Kalka- Shimla railway line, including Kalka, awarded the cleanest station many time over, of course Barog (as mentioned before) and Sheogi, short of Shimla on a saddle awesome beauty. Pune - Tea, Misal, and Patties in the canteen Karjat - Batata vada / vada pav (Potato snack) Lonavala - Chocolate Fudge / Cashewnut Chikki (cashewnut brittle candy) Neral - Seasonal Jambhool fruit Khandala - Seasonal Jamoon fruit (plums) Solapur - Kunda (sweet barfi) Kolhapur - Sugarcane juice Miraj - Saar and Rice Hubli - Hubli rice (Curd rice (yogurt rice) with onions, chile peppers, and pickles) Mysore - Dosa Tiruchirapalli - Bondas in several variations Hyderabad - Chicken biryani Calicut (Kozhikode) - Dal vada Quilon - Rasam Mangalore - Egg Biryani Ernakulam - Fried yellow bananas Nagpur - Bhujia, and oranges Guntakal - Mango jelly Chennai Central - Samosas, idli, dosa Rameshwaram - Idiuppam (Rice Noodles) Agra - Petha (candied pumpkin) New Delhi - Aloo chat (tangy potato snack) Indore - Farsan Ahmedabad - Vadilal ice-cream Surat - Undhyo (mixed vegetables) Ranchi - Puri bhaji Howrah - Sandesh Amritsar - Lassi, Aloo paratha Bangalore - Vada sambar, fresh fruit juices Jaipur - Dal bati Gandhidham - dabeli Varanasi - Seasonal amrud fruit (guava) Gorakhpur - Rabdi (a sweet made of milk and sugar) Guwahati - Tea (Assam blend) Madurai - Uthappam (spicy lentil/rice pancake) Ajmer - Mewa (Mix fruit) Vasco-da-gama - Fish curry/cutlets Ratnagiri - Mangoes, dried jackfruit Vijayawada - Fruit juices Rajahmundry - Bananas Daund - Peanuts Tirupati - Ladoos, sevai Londa - Jackfruit Allahabad - Motichur ladoos Ambala - Aloo paratha Puri - Halwah Bhubaneshwar - Dal and rice Coimbatore - Sambar-rice, tamarind-rice, lemon-rice Dehradun - Salted cucumber Gwalior, Bhopal - Boiled chickpeas with chile peppers Surendranagar - Tea with camel's milk Anand - Gota (fenugreek fritters), and milk from the dairy farm there Khambalia Junction - Potato/onion/chili fritters Dwaraka - Milk pedhas Viramgam - Fafda (ganthiya), Poori + Alu-bhaji Pendra Road - Samosas Manikpur - Cream Thanjavur - Salted cashewnuts Bharuch - Peanuts Maddur - Maddur-vade Chinna Ganjam - Cashewnuts Gudur - Lemons Panruti - Jackfruit Virudunagar - Boli (a thick sweet flat bread) Sankarankoil - Chicken biryani Srivilliputtur - Paal kova (a soft milk-based sweet) Manapparai - Murukku Abu Road - Rabri Agra- Milk Bar,Rabri at Etawah, Samosas at Mecheda on the Howrah Puri route. Rice & chicken curry at Barog.Sitabhog & Mihidana at Burdwan.Langchas at Shaktigarh.Omelletes at Mirage.Chicken cutlets at the cafeteria in Howrah station.Gulabi Rewris at Lucknow.Pethas at Agra. More on travel soon. Will be happy to know your favourite food experiences and favourite train journey. Have had this penchant desire for over a decade to go for a guided food tour to Mohammad Ali Road especially during Ramzaan. Idling, over our chotta pegs of 100 pipers, contemplating dinner plans, Sandip Ghose says, would you want to go to Mohammad Ali road ? Haven't heard such sweet words in such a long time. I was hoping he would say that. The next moment we were whizzing from the US club (where we were sipping our Chotta pegs) were dropped by the driver at Mohammad Ali road, near the Minara Masjid. We enter Memon Wada, the options are endless in 6 sq kms terrain under the JJ Flyover. I hope to see twirling dervishes, we end up seeing twirling and swirling barbecue rods and headless chicken with conclave and protruding pectoral chest muscles. We looked around asked for the food street and started walking. As we enter we are hit with a swarm of people, sellers, stalls, figs, dates, skull caps. The stench of grown up goats, the exhibition of grown up/massive billy goats. Go deeper, more jostling and even calling, food every where, sights, smells, sweet bread, ice creams, home made sweets, every part of the goat/sheep and the bada (buffalo and perhaps cow) . To name some, trotters, tongue, udders, brain, kidney, testicles, liver, intestines liver and lung apart from the common cuts of boti kabab, Keema/Seekh Kabab and Chaap.I have always wondered what is this fetish of eating every body part of the humble goat, which extends itself to an extreme of 21 dishes from 21 body parts. Its the 17th day of Ramzaan in September 2008 and we are pretty much lost in the unguided tour. The options we have are, permanent established restaurants,Hindustan, Chinese Grill (where you get to sit inside and are served their everyday regular menu) or the street food. We choose the street food, with a twist as it has some benches and chairs. Its the Azaad restaurant in Memon Wada. We order, seekh kabab, Boti kabab Bheja (Brain), Kaleji (Liver), Gurda (Kidney) and Cheeri or Kheeri (is udders or intestines), pretty extreme stuff (Sandip knows better). The atmosphere is festive almost like a fair almost a food fair. The food is a wee bit bland as we ordered the earlier courses without masala. The seekh kabab and boti are nice juicy and spicy. In all we have ordered 8 dishes with naans (sliced and roasted buns) with thumbs up and the bill is Rs 460/- (we think he seriously fudged the bill), as adjoining restaurants offer the same stuff at Rs 15/- a portion and we have been charged Rs 60/- We should have invested in a skull cap each (costing rs 10/-each) and looked like the fellow namaazi and iftaari folk or asked for the prices before digging in. Would like to rate it high on experience but low on the quality of food quotient, it was at best mela food, not the gourmet variety one would expect. Other explanations, as the prices of food in regular Muslim restaurants are so low (owing to the propensity of their clientele to pay), the ingredients are also cheaper and hence the output is mediocre. Usually the cooking prowess of the muslim Khaansaama's overcomes the lack of expensive ingredients.However on a uber- crowded night like the Ramzaan, economics takes precedence over prowess and like everyone else, everyone is out to make an extra buck.We do not stop for for the innumerable desserts on offer, its turning out to a hot and noisy. We get into the cool Elantra car and head out to the less crowded areas ofMumbai and enjoy a paan (in fact two) opposite Bhartia Vidya Bhawan off Marine Drive. Interesting evening. Have to do it in Delhi before Id, the clock is ticking, the choice is in three Lahore's in Delhi Ist Jama Masjid, Nizamuddin, or the now infamous Batlahouse in Zakir Nagar.We miss our Rs100/- per head by a massive two hundred and sixty rupees, but the objective was experience. First successful recce and sighting was done in April 2008 (target identified) and in depth recce was done in September 2008, met Mrs Dhuni Bagli she invited us over on Sunday 7th September or on Monday the 8th. She did mention, Dhansak, Patranee Machi, Farcha, ummm. 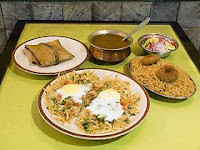 Started reminiscing about my first time (i meant parsi food), at Sarosh in Ahmednagar in the interiors of Maharashtra in the mid 80's Dhansak, brown rice (Ahmednagar has ACC&S Armoured Corps centre and school and is often referred to fondly, as Paris for the roughnecks from the hinterland of Nabha, Suratgarh and Pathankot in the Armoured Corps). Then remembered eating Ava Sethna's, food, who's 5500 sq ft house at Queens Apartments at Pali Hill Mumbai, I had lived in 2000. Of course, the berry pulao and sali boti at Cafe Britannia at Mumbai Fort, washed down with a Dukes raspberry soda. The Cafe Mocambo and Jimmy Boy again at Mumbai with nice and interesting Parsi food. Delhi has no luck to savour Parsi food, one can be lucky with knowing the the 40 odd families including Dilshad and Vispy Saher (my first boss at Times of India). Usually I haven't been lucky with invitations. So like Hannibal, decided to make my own way through the proverbial Alps and find my own parsi food. We were all set, I reconfirmed on Sunday, we are coming for lunch on Monday at the Parsi rest house. Called a few like minded friends, 2 out of three confirmed. Alex Shantanu and I got into the clean and serene Parsi Anjuman (houses the fire temple), said my pleasantries to Mrs Bagli and sat down in the dining hall of the rest house. It was medium lit with 6-8 tables for six, with a fireplace and mantelpiece with black and white photos in old frames, curtains drawn. The other table was occupied by a distinguished looking family with clipped accents and the gent wearing a vintage golf cap. Food was already flowing on their table. We did not know how to order. We waited and said food for three. The waiter came and placed a large platter of brown (caramelised rice/ pulao), garnished with 8 potato dumplings, a plate of banana leaf wrapped fish (I guess river sole), Patranee Machi. A small gap, Binoufer the daughter-in law steps in, orders the waiter to place the dining plates and spoons, they get activated, bring the crockery and cutlery with three portions of chicken Dhansak. Strangely all the portions on our, and every other table have only chicken legs. The food is as good as home made parsi food, wholesome. Its not chilly hot, its delicately flavoured as five star hotel menus would like to call it. Enjoyable. Magically three portions of dessert Laganu Custard appear ( caramel custard, crusted with resins). We polish off everything we are served, Alex and I dive into the food, Shantanu is circumspect, slowly our infectious enthusiasm catches on and he dives in headlong as well. We all love and enjoy the experience and we walked it from work.The price, we are served with bill it mentions 3 lunches rather cutely, for Rs 450/-. Ooops we missed the under Rs 100/- mark for local exotica. But, this is not local exotica its imported exotica (Parsi in Delhi). It was a nice meal. I could write treatise on my tryst with parsi's the genealogy,the anthropology, the taxonomy and their mood swings and the inconsistency in behaviour. Or their sterling qualities as philanthropist. It suffices to say as William Sacket, the cowboy in Louis L'Amour westerns would say, the parsis and definitely Mrs Bagli and her crew know how to put groceries together. This post has been lying in my mail box for quite a while. I was motivated to re look at this genre of eateries by Alex Paul. My memory bank had a store of visits and memories of Indian Coffee Houses, visited a few years ago in Delhi University, Shimla and the latest one was in Chandigarh in 2006. I could not get myself to write about them without revisiting one and going through the experience. A little bit of background, Indian coffee houses were set up by the Coffee Board in the 50s were handed over to the employees to form worker cooperatives in various regions in 1957. The strongest representation was and is in Kerala with now over 60 Coffee houses, serving also local cuisine. In all there are close to 300 coffee houses (some going extinct, faster than we sip our coffee), owing to market conditions and change in consumption and just the change in the idiom.People like Rabindra Nath Tagore, Amartya Sen and many many legendary patrons have commiserated over coffee and eats in the now halls of gloom. Quite honestly they have an old world charm, with turbaned and liveried waiters, with cummerbands and crisp white uniforms serving crisp dosa, omelette and cutlet.The Delhi or the northern chapter has, the following coffee houses, Delhi CP (next to Rivoli cinema),two in Jaipur, two in Chandigarh, Shimla, Dharamshala, Ludhiana and three in the NTPC power plant in Badarpur. They have shut down, three in Delhi University, One in Srinagar, One in Chandigarh. We should run a campaign of save the India Coffee House and its culture, before they are extinct and fossilised and along with them will go reams of stories and brewing of cultures and sub cultures. You ask anyone today who is older than 40 and nearing 40 they will have pet Indian Coffee House Story, my father a travelling salesman for over 40 years, till he was too old and become CEO has several of these stories. So does my mother, Delhi University, Miranda House and one of the first National woman athletes in the 50s has several and yours truly has a few. Most memories are of the early 80s at the D School (Delhi school of Economics) Indian Coffee House in the early 80s of sambar vada, cutlets, coffee,sandwiches, strangely none of them ever stocked chicken it was vegetarian or only mutton, true to this day, at least in the Northern chapter. The memories of our visits to the coffee houses in Shimla and Chandigarh to live up to my dear wife Praveen, who is very reminiscent and nostalgic with her memories of her visits and good times, kind of finding her childhood memories and taking our daughter (Detective An), to enable material for future memories. Now for my latest revisit, Entered the second floor of Mohan Singh Place (also colloquially called Mohan Singh Palace). On the second floor with seating are for a hundred in the covered halls with an open terrace were a rave party for a few hundred can be held, its enormous. Shantanu, (my latest partner in crime) walk in and seat ourselves near the cashier/manager. We absorb the atmosphere, the manager, Janak Raj (from Kerala), joined this particular coffee house in 1972. He has been with them for 36 years and recently became the manager. He has stories to tell, this coffee house opened in 68. The one, where Palika Kendra is was shut during the Emergency in 1975 (breeding house for revolutionaries and reactionary groups ??). The mother ship was at Janpath then called Queensway.We order to a polite Bhure Singh from Moradabad. We order, Idli Vada, one each (with their signature chutney and sambhar), tomato sandwiches, a single veg cutlet, a single mutton cutlet (comes with their pumpkin sauce masquerading as a tomato sauce) and the most expensive thing on the menu, mutton biryani. We end with a special coffee each (for some strange reason special, means more milk in North India, all over India and perhaps all over the world... Latte is more expensive. Milk is premium subliminally , hence more expensive.